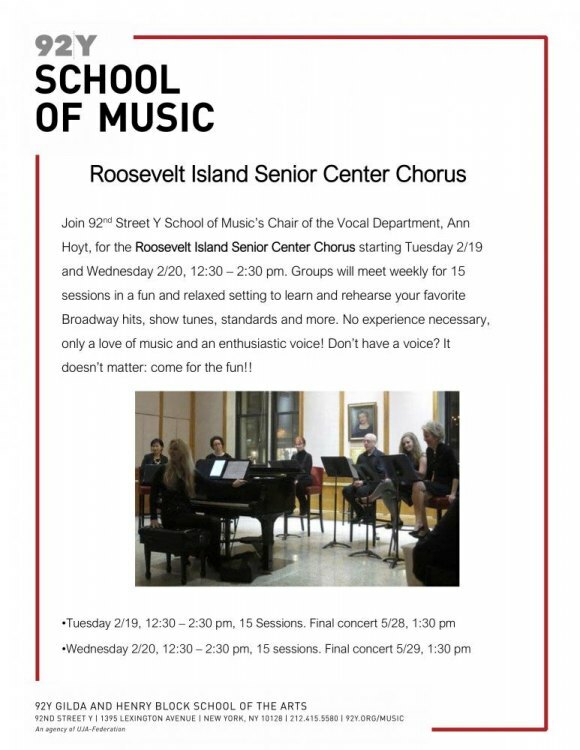 On Tuesday, February 19th, at 12:30 the 92nd Street Y School of Music launches the first of two 15-week classes creating the Roosevelt Island Senior Center Chorus. Culminating events are on the calendar for May. Broadway hits, show tunes, standards and more will be rehearsed in two separate groups, each arriving at a Final Concert at the end of May. "No experience necessary," says Ann Hoyt, Chair of the Vocal Department, "only a love of music and an enthusiastic voice! Don’t have a voice? It doesn’t matter: come for the fun!"